This smell weird to you? The Challenge is very early in production and is largely a one-man operation in Atum Software. Having said that I’d like to mention a few things that worry me, and a few things that I just don’t like. I too am a budding video game dev so please don’t take these as griefing, just constructive feedback from a concerned citizen. 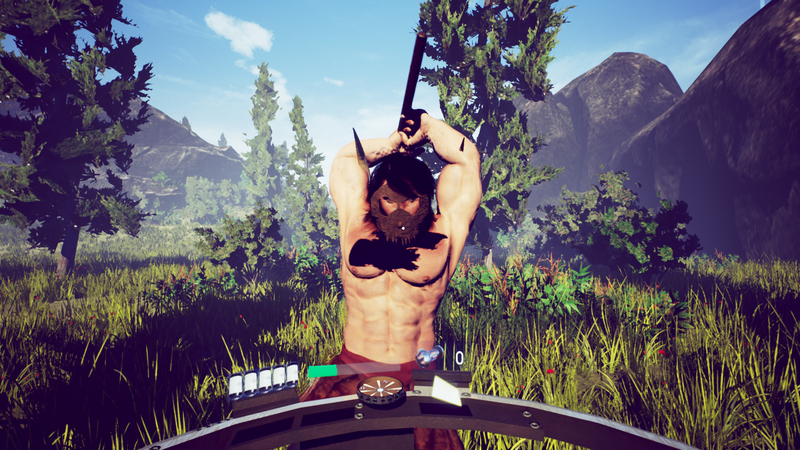 The Challenge, judging by the Steam store page, is very promising. You’re a time cop from the 22nd century trying to fix “anachronisms” (would killing Hitler be an anachronism?) while travelling to various time periods. Time travel is one of the all-time greatest sci-fi tensions and is woefully underused in video games. This makes The Challenge either novel and ambitious, or naïve and foolhardy, depending on your outlook. I fear it’s the latter; a lot of this game feels like it was the result of an “eyes bigger than stomach” approach and with just one man on the team, there’s no one there to reel him in. Anyway, on to the review – first slide! 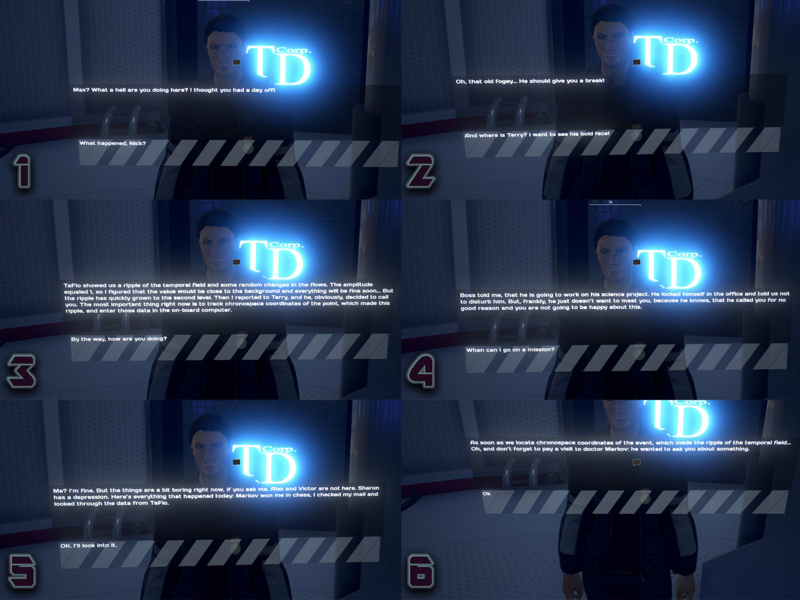 Blocks of text – having GUI elements in the worldspace is exciting I grant you, but if I can’t see Sharon’s face while we talk how will I know if she’s lying? The Challenge will throw these large, expositional blocks of text at you often enough that it really irks and definitely needs another pass. The big devs know that nothing kills momentum like extended periods of reading and will throw only the most important info at the player in this form. Yes, old-style RPGs did (and do) this but The Challenge is aiming for the FPS market and the gamers here are less patient than the predominantly older dungeon crawler demographic. Space out the dialogue, break up the monologues, perhaps extend the conversation trees. Which reminds me, the conversation trees are exceptionally broken. 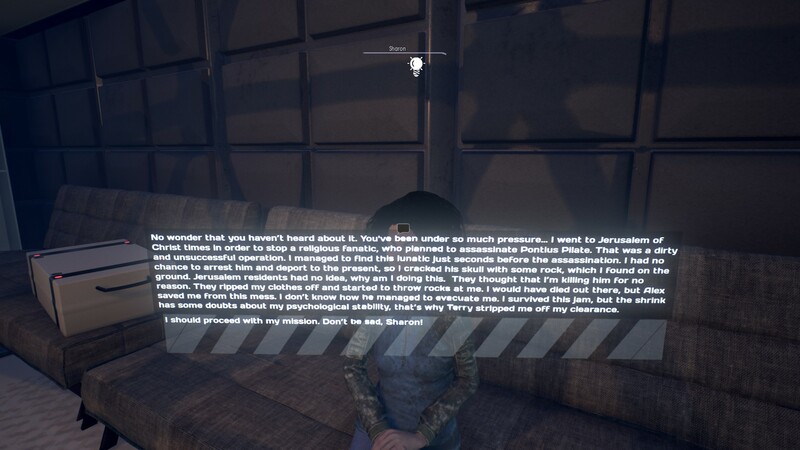 Often the response that the PC gives to an NPC will have no effect on their next line of dialogue and (more frequently than is reasonable) that NPC will address what the PC said two lines earlier. If you’re only going to give us one response in these conversations at least make them work. Below is the first interaction in the game, numbered in the actual order it occurs in. I even restarted the game to see if it was a one-time bug. T’was not. See how insanely Nik comes off in this non-sequitur laden exchange (click for larger version). Atum Software, before I go any further, please, please get a native English speaker to rewrite ALL of your dialogue. Use anyone – hell, use me, I’m very cheap – just get this cringe-inducing script fixed. This first conversation with Nik should set the tone for the rest of the experience. It certainly sets a tone but it’s more Tommy Wiseau’s The Room than the hard sci-fi clearly being attempted. It’s entertaining for all the wrong reasons. Every other conversation feels similar, like someone with google translate and a thesaurus wrote the script and this is a huge turn-off for me. Some may be absolutely fine with ignoring the plot altogether, but to my ears that sounds like skipping half the game. For me the game ran adequately. I had to turn v-sync on because of outrageous screen tearing but otherwise I got a steady 60 FPS on ultra (as long as I didn’t use a torch in the rain). I worry that this is because everything further than 5 metres away is rendered as if it’s hundreds of metres away. 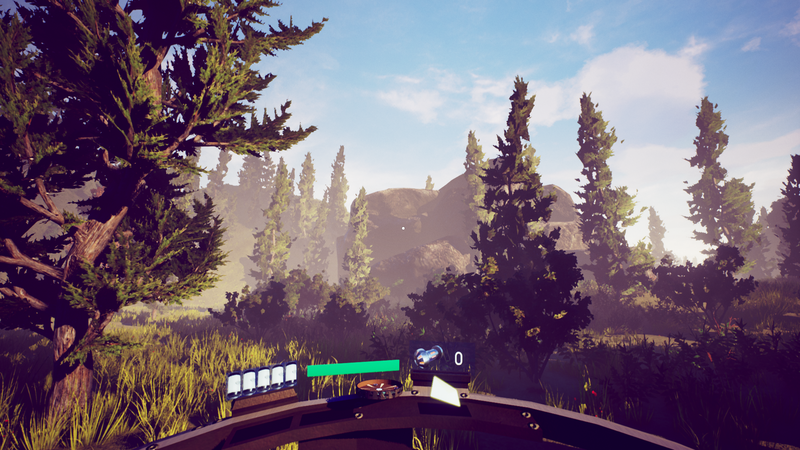 You can see this in the picture above: the HUD and the closest tree are nice and next-gen but everything else looks like my prescription desperately needs updating. I somewhat like the watercolour effect this gives the environment, but it’s in such stark contrast with the rest of the gritty, “realistic” art style (see below), that it just feels sloppy. The picture above is in Base Eon-1, the starting hub. 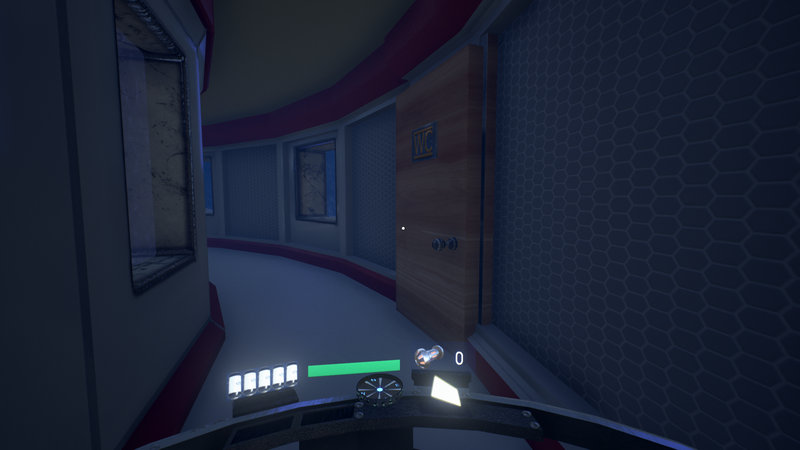 It’s clearly the future: window panes are made of expensive marble, the walls are disused honeycombs, and the one toilet in the station has the only wooden door (made of Californian redwood judging by the size of the grain). Regardless, all these little details make The Challenge a wholly unimmersive experience. 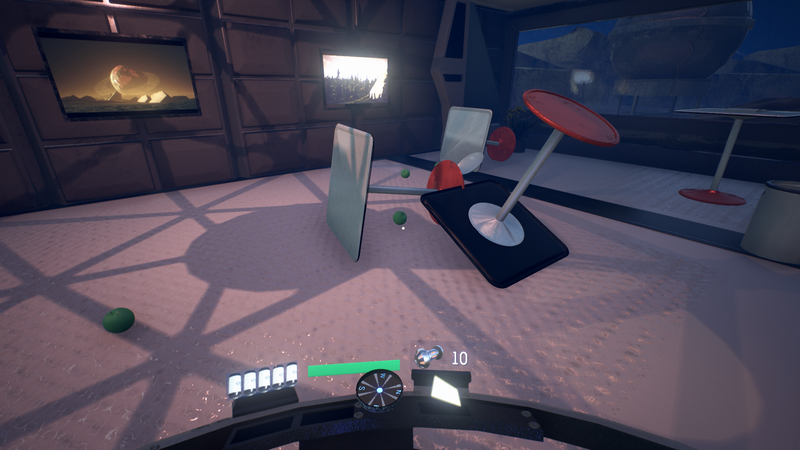 Everything from the conversations, to the checkpoint markers, to the unnecessarily movable furniture in Base Eon-1 (see below) come together to make a really unpolished product. I understand that it is in alpha but Atum Software need to have a long think about whether they want to keep developing The Challenge in the way they have been and whether they should give out any more review copies before release. Building small, broken levels hidden below the sheen of high res textures can’t be an efficient development model, nor is it honest with the consumers; the game is far less finished than it initially looks. Atum needs to use the possible testing player-base it has in Steam, build some wireframe levels, use some default shaders and have us Early Accessers try out a minimum viable product; not this prettyware laden nearly-game. Let us help you. I will have another look at The Challenge post-release optimistic that it’ll be somewhere closer to the game it could be. Good luck, sir.